I ordered the book Here Come the Beatles: Stories of a Generation by Skira (is that the author?) because I found online that it has a chapter about the Beatles fan clubs. I was pretty impressed when the book arrived. It is a hardback coffee table sized book. 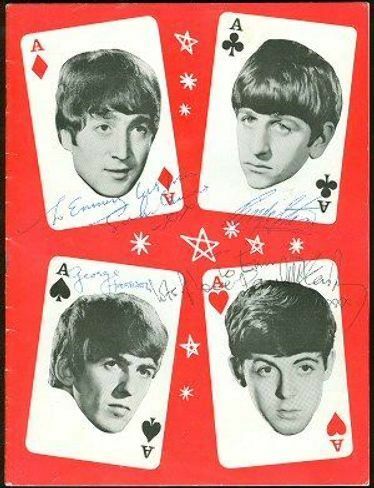 The cover is the Beatles on playing cards, which was used as one of the programs in the U.K. and it comes with a poster of the same image. When you open it up, you will see that this book is full of beautiful photographs of not just the Beatles but of rare original memorabilia such as movie posters from around the world, dolls, shoes, and a lot of great photos of things most of us will never own and only will see in person if we are lucky. Sadly, the photographs are the best part of this book. Little did I know, but it was written in England and Italian. One page is in Italian and the next page will say the same thing in English. This was extremely confusing to me and made the book hard to read. As if that wasn't enough, I have to say that this book was boring. It really was about how things in Italy were in the 60's and how according to the author, the Italian teenagers didn't appreciate the Beatles until Sgt. Pepper because they were wrapped up with the local musicians. Then it goes from 1967 to the basic history of the Beatles with information about what was going on in Italy at the time. I had no idea this book was going to be about Italy. 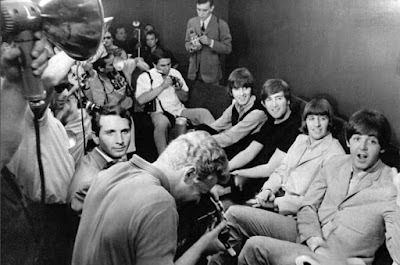 And for a book all about Italy, it really didn't have much to say about the Beatles 1965 tour that went to Italy. Since the subtitle of the bok was "stories of a generation," I thought maybe there would be stories of fans that were at the concert. Again -- there are great photos and ticket stubs of the concert. I am not sure who this book was written for. Italian Beatle fans? Memorabilia collectors? Sorry -- but I just can't recommend this book. However, I am including the Amazon link in case someone would like to get the book for the great photos. Good honest useful review that can save us some money and point authors in better directions. Writing a brief overview of my Beatles memories up to age 10, I just realised how difficult it is to write something fresh about a subject with SO much exposure. And early memories don't have anything like as much narrative as memoirists pretend they do.